we are leading suppliers & exporters ofVoriconazole Medicinein China, Russia, Hongkong, Bulgaria, Romania, India. The lowest price sellers, suppliers, distributors & Exporters from Delhi. For more info please contact at http://www.moderntimesindia.com/voriconazole-medicine.html. Description - The Brand name of this medicine is Vorzu. Vorzu medicine contains generic Voriconazole. 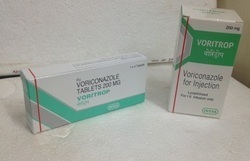 Voriconazole available in form of Tablets. 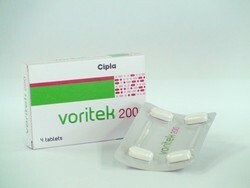 Each film tablet contains 200Mg Voriconazole. One Pack of Vorzu contains 4 Tablets. Manufacturer and Marketed company name of Vorzu is Ranbaxy Laboratories Ltd, India. USED -Vorzu 200 MG Tablet is used to treat a variety of fungal infections of the mouth, lungs and throat. Warning: Vorzu medicine out of the reach and sight of children and away from pets, never share your medicines with others, and use this medication only for the indication prescribed. The information contained herein is not intended to cover all possible uses, directions, precautions, warnings, drug interactions, allergic reactions, or adverse effects. Vhope medicine contains salt chemical Voriconazole 200 mg. It is available in the form of tablets. Vhope is manufactured by Torrent Pharmaceuticals Ltd.
We are suppliers/exporters of Vhope. Vhope is available at discounted prices. Vhope is a prescription drug and should be used under proper medical guidance and advice. Do not share the medicine with others, since they may be suffering from a problem that is not effectively treated by this drug. To be sold by retail on the prescription of a specialist only. 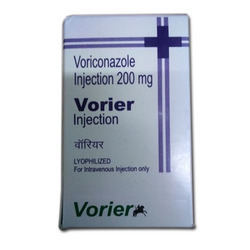 Vorier medicine contains salt chemical Voriconazole 200 mg. It comes in the form of tablets as well as injections. vorier is manufactured by Zydus Oncosciences. Vorier is a prescription drug and should be used under proper medical guidance and advice. The information provided here is for general educational purposes only and does not constitute medical or pharmaceutical advice which should be sought from qualified medical and pharmaceutical advisers. Voritek is made up of a salt chemical Voriconazole 200 mg. Voriconazole is used for yeast infections of the skin, stomach, kidney, bladder, and wounds. Voritek comes in tablet form having strength of 200 mg. There are 4 tablets in a pack and this medicine is manufactured by Cipla. Voritek is a prescription drug and should be used under proper medical guidance and advice. Keep all medicines out of the reach of children and away from pets, never share your medicines with others and use this medication only for the indication prescribed. Voritrop medicine contains salt chemical Voriconazole 200 mg. voritrop comes in the form of tablets/Injection. Intas Pharmaceuticals Ltd. is the manufacturer of Voritrop medicine. • Manufactured By: Intas Pharmaceuticals Ltd.
Voritrop is a prescription drug and should be used under proper medical guidance and advice. We are supplier of voritrop. Voritrop medicine is available at discounted price. We have other voriconazole medicines like vorizol, vorzu, voricort, voritek, vhope, voritrol, vorier, voraze, verz. Description - The Brand name of this medicine is Vorizol. Vorizol medicine contains generic Voriconazole. 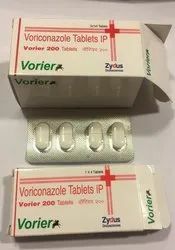 Voriconazole available in form of Tablets. Each film coated Tablets contains 200Mg Voriconazole. One Pack of Vorizol contains 4 Tablets. Manufacturer and Marketed company name of Natco Pharma Ltd, India. USED -Vorizol Tablet is used to treat a variety of fungal infections of the lungs, mouth, and throat. Warning: Vorizol medicine out of the reach and sight of children and away from pets, never share your medicines with others, and use this medication only for the indication prescribed. The information contained herein is not intended to cover all possible uses, directions, precautions, warnings, drug interactions, allergic reactions, or adverse effects. Description - The Brand name of this medicine is Vorier. Vorier medicine contains generic Voriconazole. 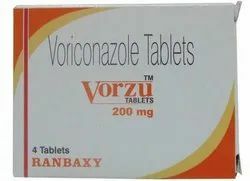 Voriconazole available in form of Tablets. Each film coated Tablets contains 200Mg Voriconazole. One Pack of Vorier contains 4 Tablets. Manufacturer and Marketed company name of Zydus Oncosciences, India. USED -Vorier Tablet is used to treat a variety of fungal infections of the lungs, mouth, and throat. Warning: Vorier medicine out of the reach and sight of children and away from pets, never share your medicines with others, and use this medication only for the indication prescribed. The information contained herein is not intended to cover all possible uses, directions, precautions, warnings, drug interactions, allergic reactions, or adverse effects.